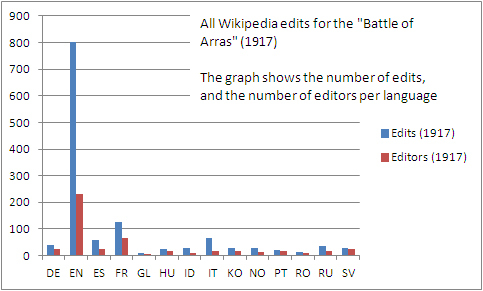 Wikipedia is in a position of influence for how people learn about history, but how do the Battles of Arras (1914, 1917 and 1918) differ across the site? 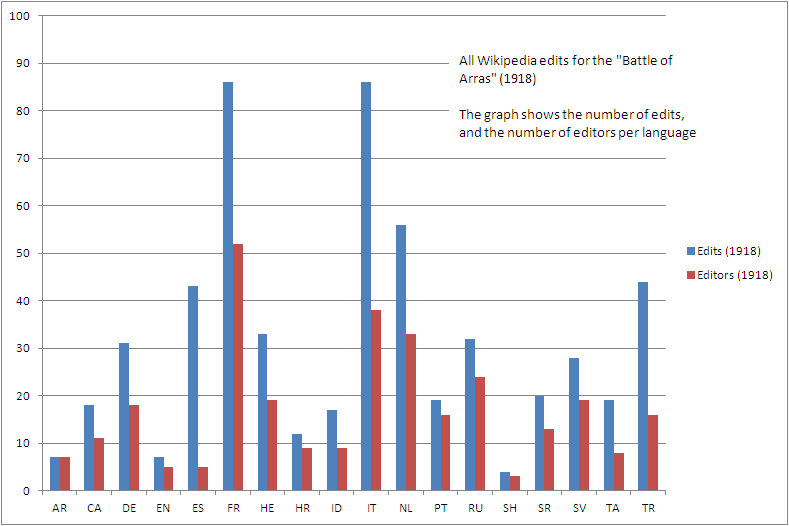 What do the edits and page changes tell us about these battles and how different countries see them differently? However the longest 1917 page isn’t in English, and more languages have a page for the 1918 battle – some of whom (TA = Tamil) have never made an entry before. All of these statistics are from April 2 2012. 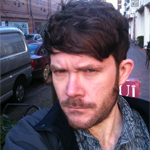 This entry was posted in From Space to Place, The Battle of Arras, The Memory of War and tagged Blogs. Bookmark the permalink. ← Is act of remembrance losing its original ‘never again’ sentiment? 8 Responses to All Quiet on the Wikipedia Front? Hi Pat – Thanks for this, really interesting perspective. I was just trying to reproduce your results with a view to digging deeper into the Wikipedia editing process and what’s behind these articles, but I’ve fallen at the first hurdle. I can’t really reconcile these figures with the ones in your spreadsheet – could you explain your methodology here a little bit further? 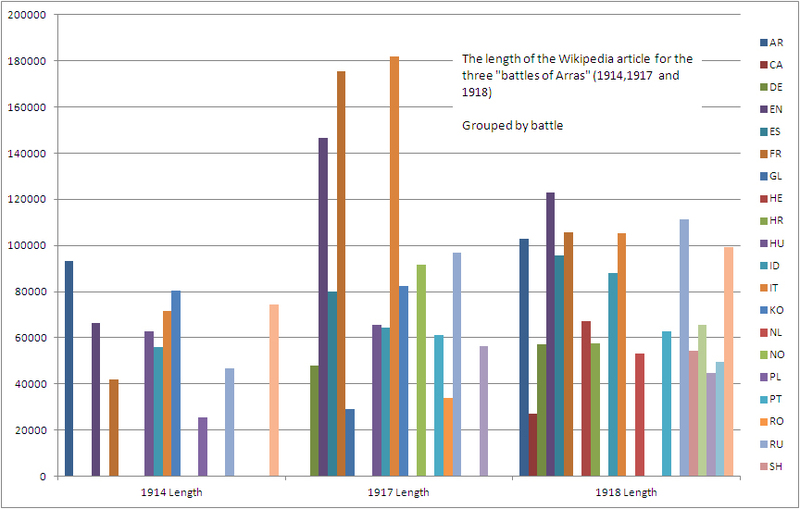 However, one of your observations – the length of the Italian and French Wikipedia articles on Arras 1917 – also raised my eyebrows, and I think I can help explain it. Looking at the structure of these articles, the images used, and the referencing it appears those articles are fairly closely based on translations of the English Wikipedia article. 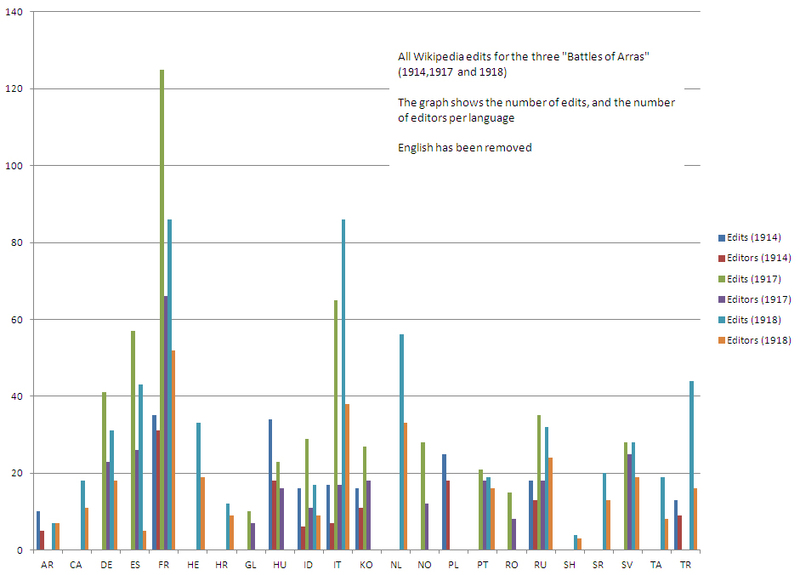 This also explains why the French and Italian articles are very long, but have far fewer edits than the English article. 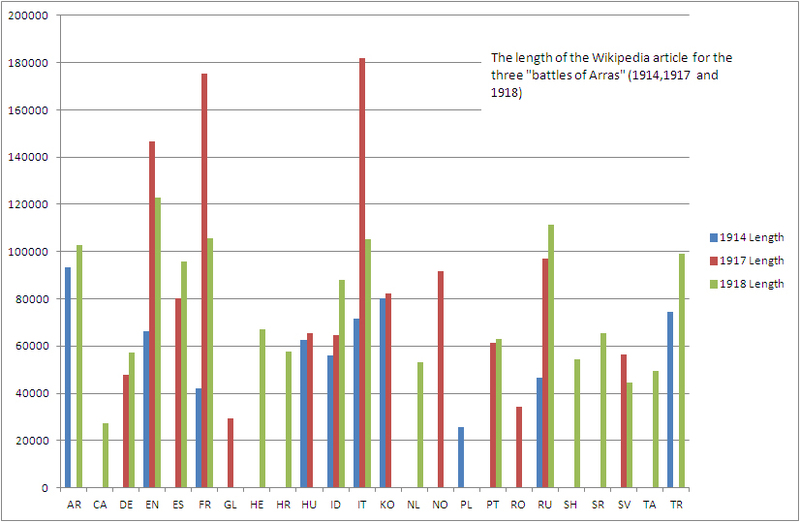 In some situations it is possible to notice different competing national narratives in Wikipedia articles. 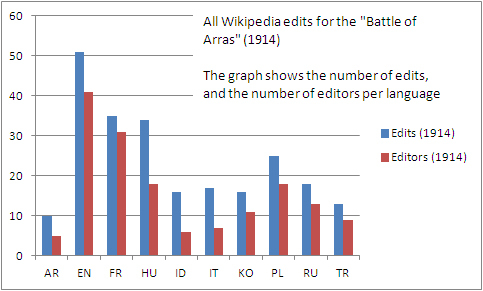 My hypothesis for World War I would be that topics are covered in the English Wikipedia in relation to the impact they had on Britain, Canada, Australia and the USA, though I have never been able to assess this, and as we see with the Arras (1917) article any trends based on editors’ interests can also be obscured by Wikipedians’ habit of translating strong articles into other languages! Very simple approach with the api and didn’t go any deeper than that. I think the nature of an edit can be for so many reasons and so I’d not attach any weight to this data, I am no academic and I am not sure much could be interpreted from it – bar Interesting facts like the appearance of Tamil as a language. I’ll probably put the code I used on github when done. Hope this isn’t too disappointing. If this is something you’re interested in, I’m sure we can find ways to explore it further! Just a way for a computer to visit and download the page – so it is effectively a file size. Maybe check with Kate to see if a deeper analysis could be done as a blog post? 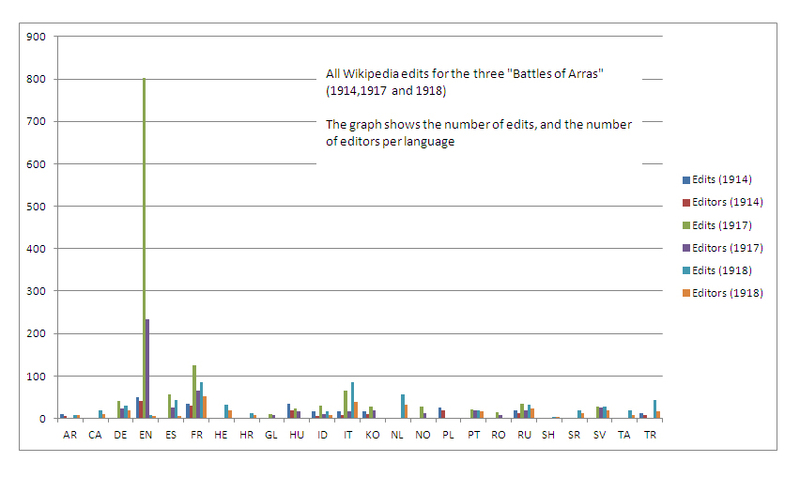 Hi Pat, Interesting piece of work, but it makes me curious about Wikimedia Commons where we have a category for http://commons.wikimedia.org/wiki/Category:Battle_of_Arras_%281917%29 but not for the other two. The 1915 picture may well be accurate “in some way”, as the trench might have not moved since the end of the 1914 fighting. Trying not to sound either critical or sloppy in my work – I think they are designed to show differentials in editing as a possible indication of “importance” and then as to why this importance may exist.